Quick Take: The Big Bang Theory, "The Cohabitation Formulation"
Review: The Big Bang Theory, "The Cohabitation Formulation"
(S0416) Bernadette gets annoyed that Wolowitz won't ever stay the night because of his controlling mom, and suggests they move in together rather than squeak by on the few nights a year when his mom is out of town. After a fight over whether or not he should spend time with Bernadette, he leaves his mom's house for the first time, with all intentions of living happily ever after. But Howard is more high-maintenance than Bernadette ever realized because his mom does everything for him, and it doesn't occur to him to do anything for himself. In the end, she's affronted and sends him back home, where he gets grounded for running away. Meanwhile, Raj's sister Priya is back in town and she and Leonard decide to try a real relationship, despite Raj's fierce disapproval. They get along great, but Penny takes it harder than she thought she would. Amy Farrah Fowler offers the expected support, while also occasionally hooking Penny up to electrodes to see what's going on in her brain during her emotional upheaval, but even she is eventually won over by the lovely Priya. Which doesn't help Penny at all. Sheldon, at Amy's urging, comforts her with some hot tea. Look! Raj is getting to do something, even if no one pays any attentin to him at all! He's so often off to the side with little to do other than get drunk so he can say anything at all around pretty girls, that it's nice to see him talking through a whole episode, and even when no one listens, it's nice to see him trying to be active. Trying to be the Alpha Male to protect his pretty sister. She doesn't need it, of course, but it's sweet in a totally misguided way. 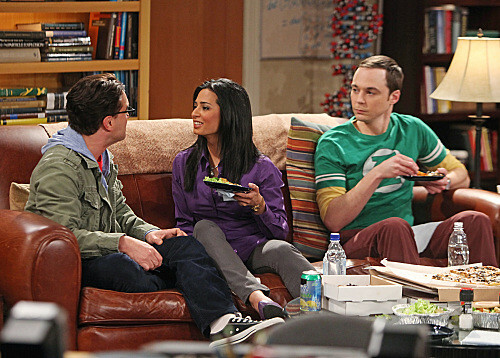 In this episode, Leonard gets to be the oblivious, semi-jerky one, while Sheldon, as tertiary friend, stops his usual mutual insulting of Penny to serve as the comforter and good host. This is also nice, as so often, he's just selfish and insulting. It's also nice that Amy, for all her clinical detachment, is actually more aware of social mores than he is, and is a good influence on him. Best though was that Howard almost took a big step toward independence. Well, he did, but he had no idea what it really meant, and got sent home to finish baking because he's obviously not done yet. I love that Bernadette put her foot down: she's little and cute, but she knows what she wants, and she won't be second-best! Go her! More thoughts on The Big Bang Theory, "The Cohabitation Formulation"
Does this episode mean we get to see more of Priya? She's smart and modern, and not much of a geek, and it's nice when Penny doesn't have to be the only mainstream character on the show. She relates to Leonard on a totally different level than anyone else on the show, and she makes Raj react differently to the world. She shakes things up in a good way. I once again repent not liking Amy when she first appeared. Maybe I was grumpy that day. But she's shaping up to be all kinds of interesting, and funny in her own way. And she's found her place in the group, even if she has to define it herself. How much longer before Penny persues Leonard? Much as I don't generally like the desperate-woman sort of storyline, comedies have more leeway with social interactions, and, really, how often is a super-nerd the desired one? That should be a fun storyline. Video: The Big Bang Theory, "The Cohabitation Formulation"